I found this story in the New York times talking about the homeless problem in Key West and the fact that the city has hired extra police to enforce "vagraceny." Below are a few pictures from my last trip to Key West. I'm not saying this is right or wrong, I'm just saying there are a lot of seemingly homeless people in Key West. Lots of fish, too!! As I prepare for my upcoming bonefishing trip, one piece of gear that I can't leave home without is my waterproof point and shoot camera. I use an Olympus Stylus 850 SW which is waterproof to 10 feet and shockproof with a 5 foot fall (in case you drop it out of your pocket). It's an 8 megapixel camera that takes a good picture and has some pretty helpful features. It also has an underwater mode for taking a more wide angle picture. Olympus also has a line that is a bit better than my camera called the tough series. If you're interested, check it out here. Canon makes an underwater point and shoot that I also really like and it can be found here. With all the talk of whether or not you should lift fish out of the water to take a picture, why not why not use an underwater camera that will let you dunk the camera and get a great shot of your fish. Plus, mine comes in a cool orange color. Just hope a cuda doesn't mistake it for bait! On Saturday I had a chance to get out and shake the rust off the casting arm. I was casting my 9 weight rod. I practice by taking a tape measure and putting a straight line of tape out to about 90 feet. Then I setup cones at varying distances just off the tape. I usually start by making several casts to 50 feet. Then I'll switch to 60 feet. These are the two distances that I find you use most in saltwater fly fishing. After that, I start trying to throw to 80 feet. This will last a little while and then I'll just try to go for long distance and see what I can do. I hit 100 feet once, which is pretty good for me. The thing to remember in saltwater fly casting is that slackline is the absolute enemy. You want the line to be perfectly straight to the target. The leader should lay out in a straight line. Any slack line, I.E. a curve in your line, will have to be taken up in the form of a line strip once your fly is in the water. In many cases, if you have slack, this will give the fish enough time to eat the fly, figure out its not really food, and then spit out your fly all before you've had a chance to even feel the fish. Notice the fly line running running left of the tape measure is in a straight line. Remember, this ain't a dry fly. The angler must be tight to the fly in order to set the hook. When you practice, keep the slack out of the cast. Slack line is the enemy. The Crazy Charlie fly was developed by Charlie Smith on Andros Island. Charlie ran the famous "Bang Bang Club" which, in the early days, was what you would picture as a true out island bonefishing experience. Charlie is truly a bonefishing legend. If you really want to check out a great fly fishing film about Charlie and his fly, check out In Search of a Rising Tide or Drift. Jamie Howard put together Rising Tide and has done Location X and Chasing Silver about Tarpon. Drift is done in part by Tom Bie at The Drake. Continuing our bonefish fly tying series, here's the Crazy Charlie. I tried to find the results of the 2010 March Merkin but had a hard time so I thought I would write to the tournament and find out what the results were. It was a very tough tournament as the weather was awful compounding and worsening the low water temps which were in the 60's. It is very difficult to get a Permit to eat a fly when water temps below 70, specially when they are dropping. We also had heavy rain most of the second day and clouds on all three days. Only 2 fish were caught. Winning angler was Greg Smith guided by Scott Collins. 2nd place was Mark Hoskin guided by Bob Paulson. Despite the weather and difficult fishing which has been a theme all year to date, the participants had fun and the tournament raised over $17,000 for BTT and the Don Hawley Foundation. The Del Brown Merkin is up next in terms of Permit tourneys and is July 21-23. There are a few ways to look at what rod you should use for a bonefishing trip. The all around opinion is that an 8wt rod is the best choice. Well, the reality is that saltwater fly fishing is no different than freshwater when it comes to the fact that no one rod will cover every situation. In saltwater fly fishing great Chico Fernandez's book Fly Fishing for Bonefish, he argues that while an 8 wt is still the best all around rod for bonefish, "I'm not limited to one rod. Furthermore, it doesn't make sense to travel to some bonefish destination for a few days or a week with just one rod." I agree with that. My go to bonefish rod is my Scott S3S 9 weight. I am a huge fan of Scott fly rods. They are made in Montrose, Colorado and Scott just makes fly rods. Not reels, not other gear, they just focus on rods. The S3S has been replaced by the S4S, which is such a sweet rod. I haven't had a chance to cast it yet, but I have looked at one. They also have won numerous awards and accolades so you can bet they are top notch. Why a 9 weight? In my experience, the wind on the flats is almost always blowing. Sometimes its blowing hard, and the little bit extra in the 9 will let you get away with a little bit more. It also helps you land fish a bit easier, and if you hook the big one, which is a very real possibility if fishing the Keys or certain areas of the Bahamas, you'll be glad you've got a bit more muscle. The 9 wt also doubles as a great Permit rod and is also great for general saltwater use. You hear a lot about the need for fast action rods and I was always a little skeptical of this. Many Keys guides will tell you to overline your rod by one line weight, which essentially will kill the fast action. They tell folks this because a lot people who don't practice their casting and have trouble throwing a mean loop will have a harder time with a fast action rod. The fast action really helps, though, with the wind. It helps you throw tighter loops which in turn cut through the wind better. My backup rod is an Orvis T3 8 weight which is a midflex rod and therefore not a fast action rod. I'll fish this if the wind is down. You could just as easily get by with a 7 wt for calm conditions. Whatever your choice, make sure it's a four piece so it can carry-on easily. As most of The Bonefish Flat readers know, my favorite fly fishing personality is Flip Pallot. Walkers Cay Chronicles was a fantastic show and I wish it was still around. Most of the shows today don't focus on fly fishing anymore, just on bait casting. Flip was different. His show incorporated great writing and profound insight on fishing. He usually used a fly rod and you could tell that fly fishing was his passion. I saw this weekend that Flip has joined TFO fly rods. These rods are worth a look. I have never cast one, but they are manufactured overseas so they can build a rod that costs significantly less than those built here. Check out the TFO site here for more information. Lefty Kreh has been with TFO for some time now so you know that's a good thing. THE most important thing you can do to get ready for any fishing trip is to get your casting in order. This weekend is supposed to finally have some good weather, so I'm going to be practicing my flats cast. One of my main casting flaws, of which I'm sure there are many, is tracking. Tracking refers to the direction your fly rod tip travels in relation to where you are trying to cast the fly. Ideally, you are moving the rod in a straight line path (SLP) in order, in part, to keep your loop tight and to deliver the fly on target. If you play golf, being "off" on your tracking is like hitting a hook or a slice. I'm going to work on this by practicing my cast using the pantomime method indoors. I'll do this indoors by mimicking my cast and line my rod hand (your right hand if you're right handed) with a straight line on the ceiling. One of the best ways to do this is to use the corner where the ceiling meets the wall. Stand with your side facing the wall and practice casting but make sure you're hand "tracks" with this seems. It's good because on the flats, you'll usually want to cast a bit off shoulder as you'll be dealing with wind. If you have questions, leave a comment and I'll get back to you. Of course after I setup my post for today's page, the New York Times Editorial Board has written in favor of the Everglades deal. I'm in agreement, too. Let's save this land and the tarpon, snook, redfish and all the other species that need this habitat for survival. Some of you may have seen the series I have been posting from the New York Times called Toxic Waters. It's a very in depth series about the status of our nation's drinking water. The current article came out this week and it details how old our water systems really are and how much it costs to update them. Why does this matter and who really cares? Anyone who enjoys rivers and oceans should. Just as an example of my backyard, the Potomac River is regularly flooded with poo and all sorts of other nasty sewage after big rains. The Potomac flows into the Chesapeake Bay which is home to where most of the Stripped Bass on the East Coast spawn each year. It is also home of hordes of baitfish which will feed some of our other favorite saltwater species like Redfish. Be sure to read this article so you can better understand how old our country's infrastructure really is and why we should be paying attention. I've pulled another article from the NYT which talks about controversy surrounding a recent attempt by Florida to preserve, at great cost, a huge parcel of land in the Everglades. Turns out it may not be such a great deal after all. However, I'm inclined to think that any preservation of the Everglades, no matter how big or small, is a good thing for the country. Read the article and you decide. This is the second installment in The Bonefish Flat's saltwater fly tying series and it fits nicely with our series on the bonefish travel series. Why? Because during my last bonefish trip, I showed my fly box to our guide and asked him to pick a fly. He immediately went for the gotcha clouser. It took me a while to find the pattern, but it is a clouser minnow tied with pink thread and craft fur. Be sure to tie some of these for your next bonefish adventure. We've got a great week lined up for you. I've shot some more fly tying videos and am editing those now. Apparently YouTube only allows 10 minutes so I've had to cut down the length. Tomorrow look for the gotcha clouser. Today, we're continuing the bonefish travel series as i prepare for a bonefish trip. One of my favorite pieces of gear is my Orvis Carry-it-all Rod and Reel Case. For my trip, I'll bring two fly rods, an 8 wt and a 9wt along with two reels. I print off a copy of the TSA carry-on regulations in case I get any grief, of which I've been pretty fortunate so far. Just to be safe, I usually divide my flies into two boxes and I'll check one box and I'll carry on the other. Here are a few pictures of my bag. I divide leaders and tippet into two and carry-on half and check half, too. Remember, if you fly international, you get to check a bag for free so it's not a big deal to bring a check-in bag. The Orvis carry-on is also good for packing your sun gloves, buff, point and shoot camera, and it has handy front see-through pockets where you can keep your boarding pass. The slots are adjustable so you can make some areas bigger and some smaller. My other carry-on will be a small backpack where I'll take a change of clothes, book (always The Old Man and the Sea for my bonefish/flats trip), and my iPhone. This weeks conservation minute is about Bluefin tuna. Bluefin are the most expensive meal in the sea, and they are in danger. The U.S. doesn't always do such a great job on conservation, but kudos for recently agreeing to an international ban on bluefin tuna as their population is in serious decline. The Japanese consume more bluefin than any other country in the world, and they are refusing to support the ban. This is a problem. Be sure to read this article from the Washington Post and make your own decision. But every animal in the ocean is part of a larger food chain. Keeping with our new series on how I'm going to get ready for my upcoming bonefish trip, I wanted to talk about an essential piece of gear. When fishing from a skiff with your favorite guide in a far off land, you're going to want a boat bag. Skiff's tend to get wet from spray or rain or chop or what have you. Several manufacturers make nice bags that will keep your stuff dry. I use mine to store wallet, keys, phone, flies, camera, and other stuff you don't want to get wet. I like the bag to be on the smaller side just because the skiffs tend to be pretty small, and if you're fishing with a buddy, he or she will want to have a bag or storage too. I use a bag from Bass Pro Shops because the price is right and it folds down so I can pack it into my carry-on bag. It has done a great job on several trips now and I use it to store saltwater gear when not on the boat. I've included a few pictures. If you want a fancier bag, take a look at Simms or Patagonia. They have some great gear too. Here is a clip from one of our Pirates of the Flats where he is points out a sustainable salmon farming operation. If you've ever wondered why "farmed" salmon aren't good for our environment, this will give you some good information. Starting this week, I'm going to be starting a new series about how I get prepared for a bonefishing trip. I'll take one day a week until my trip in May to show folks how I get ready. It may seem like a ways off, and right now it sure does, but I've got a lot to do to get everything just right. I'm going to be talking about some of the gear that I consider necessities and share some of my other tips to get you ready for your trip of a lifetime. I'm going to be tying flies, tying leaders, and getting my fly casting stroke perfected. Today I had a chance to get out my rod and actually work a little of the winter rust off. The cast will be there in time for the trip. To start, off this new series, I wanted to share where my Bahamas fly box is right now. The left side are size 4's and the right size 6's. Left side are plenty of Gotcha's in various weights, 2nd row are crazy charlies with the last two being Christmas Island specials. 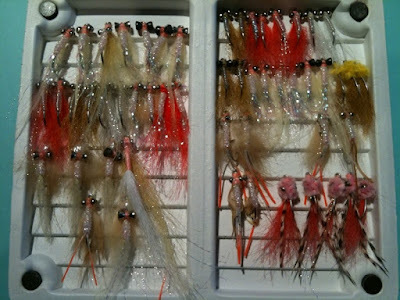 The third row are Simrams and a Gotcha Clouser, which are going to be the the next fly in the tying video. Last row are hot legs Gotchas, which are my current favorite bonefish flies. Moving to the right side, lots of crazy charlies in different colors. Row 2 are more gotcha's in various weights with Horrors on the end. Next row are hot legs gotcha's and last but not least, pink puffs. I hope everyone enjoyed the fly tying video last Monday. I had a good time putting it together and will get more up soon. Let me know if there are any flies you want demonstrated. The most prized game fish on the flats, or maybe anywhere, for the saltwater fly fisherman, is the permit. Permit are also in trouble. recent efforts to protect permit from net fishing have been rejected by the Florida Wildlife Commission because of "lack of information." This may be a bogus argument, but, to use the parlance of our times, it is what it is. Fortunately, our friends at Costa sunglasses have teamed up with the Bonefish and Tarpon Trust to begin to gather the information needed to protect our beloved permit. Project permit has been launched and can be found at http://www.projectpermit.com. The idea is to provide anglers with tagging kits to better understand the habits and patterns of permit. Project Permit will kick off on March 14 in Key West at the March Merkin fishing tournament. But anglers can start requesting their tagging kits now by e-mailing at bonefish@mote.org or by going to the Web site. Below is the official Press release from Costa. Daytona Beach, Fla. – Mar. 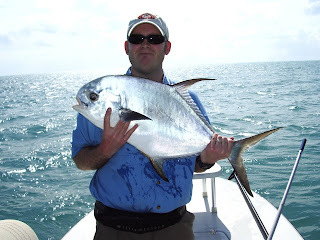 5, 2010 – Permit are often referred to as one of the most elusive game fish in the Atlantic Ocean, captivating salt water flats anglers for years in their quest to catch them. And yet, little is known about this mysterious species. What are their spawning and migration patterns? How healthy is the fish population? What regulations are needed to ensure adequate stock for future generations? Costa® and the Bonefish Tarpon Trust (BTT), a non-profit organization dedicated to scientific research and policy support to ensure healthy populations of bonefish, tarpon and permit for future generations, have teamed together to launch the first known extensive permit tagging program in Florida. Working with anglers and conservation partners statewide, the group hopes to tag and monitor data of more than 6,000 permit over the next five years, with hopes to expand Caribbean-wide. The success of the tagging program relies heavily on angler participation throughout Florida and the Caribbean. Currently, it’s not known whether permit caught in the Florida Keys are from the same or different populations that those caught as far north as Tampa. And if research findings from tarpon and bonefish are any indication, it’s not to be assumed that permit are homebodies: tarpon tagging research has shown migrations as far north as the Chesapeake Bay in the Mid Atlantic, and bonefish tagged in the Florida Keys have been recaptured 150 miles away in The Bahamas – much farther than ever anticipated. Costa is supporting the program through a grant to the BTT, and is donating a portion of proceeds of its new sunglass style, Bomba, to the permit tagging project. All recreational and sport anglers are open to participate in the permit tagging program. The initiative officially kicks off at the March Merkin Permit Tournament in the Florida Keys, March 15 – 18, 2010. There, anglers will be able to pick up tags and learn more about the BTT’s initiatives. Anglers can also request permit tags by e-mailing the Bonefish Tarpon Trust at bonefish@mote.org, or call 239-283-1622. Learn more about the program at www.projectpermit.com. As the leading manufacturer of the world’s clearest polarized performance sunglasses, Costa offers superior lens technology, unparalleled fit and durability, and a lifetime warranty against manufacturer’s defects on all of its products. Still handcrafted today in Florida, Costa creates what has been referred to as the highest quality, best performing sunglasses on the planet for outdoor enthusiasts. For Costa, conservation is all about sustainable fishing. Many fisheries that should be vibrant and healthy are all but devoid of native fish because they have fallen victim to poor fishing practices, unregulated development, lack of watershed protection or all of the above. Costa works with partners around the world to help increase awareness and influence policy so that both the fish and fishermen of tomorrow will have healthy waters to enjoy. Costa encourages others to help in any way they can. For more information, contact 1-800-447-3700 or visit the company’s Web site at www.costadelmar.com, or join in the conversation on Facebook at www.facebook.com/costadelmar.com or Twitter @CostaSunglasses. One of the true legends of salt water fly fishing is Jimmy Albright. He's a legendary guide in the Florida Keys and a true pioneer of the long rod. If you ever tied an Albright Knot to connect your fly line to your backing, or your leader to your line, or for any other reason, thank Jimmy next time. Costa Del Mar has a great addition to its Web site called the Costa C Channel and it has some great videos. There is a series of fishing classics from the IGFA including one on Albright. Check out a video of Albright bonefishing here. More of these videos to come. I had a chance to check out the promo clip for the movie Drum by WorldANGLING on my iPhone during a trip last week. These guys do not dissapoint. This movie is about red fishing in Louisiana and has a lot of great shots, great tunes, and big fish. Be sure to check out their movie and if you're in the Keys, give um a call and go fishing with Dave or Will. Drum preview by WorldANGLING from WorldANGLING on Vimeo. One thing I neglected to mention in my previous post is the commitment that Chris and Wendi Peterson made to Hells Bay customers and the Hells Bay brand. When the company was purchased three years ago, they contacted everyone who had put a deposit on a boat and offered them $10,000 toward a new skiff which they went on to build with no deposit. Customers accepted the offer and received their Hells Bay skiffs. This really shows the companies commitment to us, the boat owners and anglers, to make the finest skiffs in the world. My favorite "fishing" celebrity is without a doubt Flip Pallot. The Walkers Cay Chronicles was the best Sunday fishing show ever. Period. Why the show went off ESPN is beyond me, but it did and so all we fans can do is go fly fishing. I was just surfing on Hell's Bay Web site and I hit the jackpot. The site has many "lost" episodes of Walkers Cay so be sure to check them out. The link is HERE. 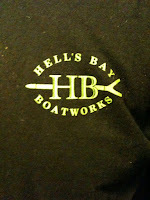 I've been a fan of Hells Bay for a long time and have followed the company for some time. The company was started by Flip and Hal Chittum and was noted as a boat for captains and anglers very serious about shallow water fishing. A few years back the company fell into bankruptcy and has emerged bigger and better than ever. Not really sure what happened, but the company went under and lots of people lost out on boats that had been ordered. Fast forward a few years and Captain Chris Peterson bought the company and has turned it around. The boats are better than ever with Peterson having brought back Tom Gordon, a master boat builder, to the company. Gordon was one of the original builders but left during the turmoil years and founded his own company, Gordon Boatworks. Some day I WILL have a Hells Bay Marquesa. 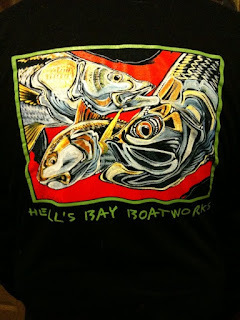 In the meantime, I'll keep wearing my Hells Bay shirt and dreaming. Below is a picture from yesterday's Washington Post of the dead zones of the Chesapeake Bay. According to new reports, there are over 200 dead zones in the Bay now. To put this in perspective, in the 1950's there were 16. Why is this happening? Almost a quarter of the dead zones are a result of chicken poo, cow poo, and other livestock and poultry fertilizer. There is a great article from the Washington Post here that really details what is going on along with legislation pending in the U.S. Senate to help clean this up. It seems like the problem is that farming now consists largely of mega farms and fewer mom and pop operations. Perdue has built a plant to take care of some this problem, but more needs to be done. Be sure to read the article and learn a bit more about how what we eat from the store affects how we fish. Remember, most of the Rockfish/Striped Bass on the East Coast spawn in the bay. One of the first things we can do is begin to notice where our food comes from and start thinking about how many people there are and how many mouths to feed. The Bonefish Flat is now up and running with video. I have started a channel on youtube so feel free to check it out. The first video is one on fly tying and features McVay's Gotcha. If you're going fishing in the Bahamas, you'll need these. I hope folks enjoy. If you have questions, just let me know. More flies to come. I'm still experimenting with the best way to tie and film this.